When my son was about ten months old, we finally decided to put him in the church nursery. As new parents we (or more accurately, I) was a bit paranoid about having someone else take care of my child, so I held him in the service with us until he just became too active and noisy and I knew it was time. I tried my best to prepare him – I stayed with him in the nursery for a couple weeks so he could get used to it, but it didn’t seem to matter. I was anxious about leaving him, and he was anxious about being left. For the first month he gave me the most pitiful looks and gut-wrenching cries whenever I dropped him off. That was my first real experience with separation anxiety, and since then I have had times with each of my kids when they were nervous about leaving me. I do think it is important to make the time away from each other as positive and easy on my kids as possible, and to do that I need to figure out what is making them anxious. One of our children didn’t want to go to their class at church for a while, but we figured out that our child was uncomfortable with someone in the class – we switched to a different classroom and it was fine. My kids might get nervous because of the unknown. If I stay with them the first couple times in a new situation, they adjust quickly and it’s not a problem for me to leave anymore. Sometimes there are definite things I can do to make a situation more comfortable for my child, and I will do that wherever I can. But sometimes you just can’t fix everything. As a mom, that is so hard for me to think about. I don’t want my kids to feel fearful, and I wish I could magically take away all their anxieties. But the bottom line is that’s not my role. I can’t always be with them. I can’t take away their fears. So I need to point my kids to the one Who can. I want them to remember that God will always be with them, even when I’m not. A great book for teaching this concept to kids is God Watches Over Me. This would be a perfect book to read to your kids before leaving them in a new situation, to keep the thought that God watches over us and takes care of us at the forefront of their minds. If I’m honest with myself, this is a reminder that I need as well. 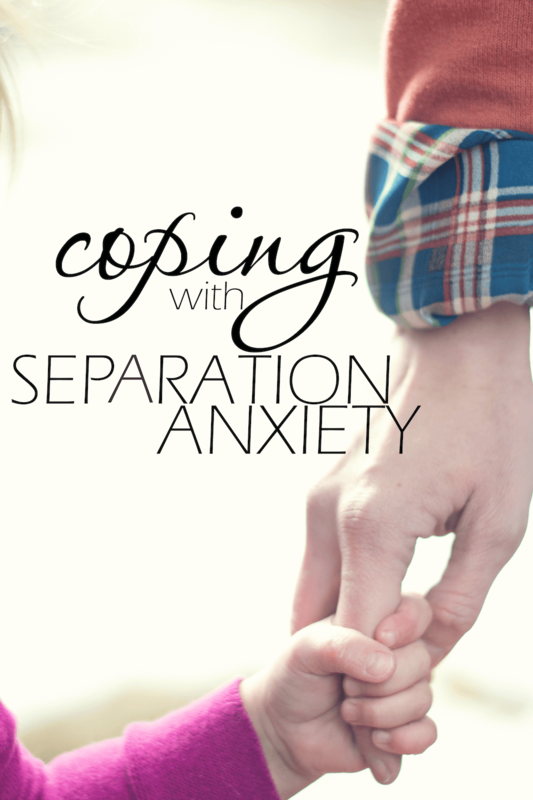 Separation anxiety can be just as difficult for me as it is for my kids. It still hits me in the gut every time I hear one of them crying. I sneak back to check on them, and I worry about how they are doing. But I need to remember that when I am not with my kids, God still sees them. I want to spend more time on my knees praying for my kids than I do worrying about them. When I was growing up, one verse that my mom taught my siblings and me was Isaiah 41:10, for times when we felt anxious. Now that my kids are old enough to memorize verses, I think this is one we will be adding to the list. I love that verse because it tells kids everything they need to know to help them overcome separation anxiety, in a nutshell. And they don’t need to fear. My kids may have to deal with separation anxiety many more times in the future, but I think if I can plant that verse in their little hearts, they’ll have what they need to overcome their fear and go bravely into new situations – as they remember that there is Someone who loves them and will never leave them when they put their trust in Him. Callie Martinez is a wife, a mother, a part-time dental hygienist, and a fan of coffee. She has been writing regularly on her blog, Through Clouded Glass, since 2008. When she is not taking care of her three children (all under four years old), she enjoys spending time with her husband, reading, and working on her endless list of DIY and sewing projects. She is passionate about her faith in Jesus Christ, her family, and encouraging others to keep an eternal perspective through the day-to-day. This entry was posted in Blog, Tommy Nelson and tagged Callie Martinez, Family, Kids, Parenting by Callie Nicole. Bookmark the permalink.